Definition at line 22 of file infsupp.h. Definition at line 25 of file infsupp.h. Referenced by SetupFindFirstLineW(), SetupFindNextLine(), SetupFindNextMatchLineW(), SetupGetLineTextA(), SetupGetLineTextW(), and test_SetupGetTargetPath(). Definition at line 42 of file inffile.h. Definition at line 68 of file infpriv.h. Definition at line 24 of file infsupp.h. Referenced by InfFindFirstMatchLine(), InfFindNextLine(), InfFindNextMatchLine(), InfpFindFirstMatchLine(), InfpFindNextLine(), InfpFindNextMatchLine(), SetupFindFirstLineW(), SetupFindNextLine(), SetupFindNextMatchLineW(), and test_SetupGetTargetPath(). Definition at line 41 of file inffile.h. Definition at line 67 of file infpriv.h. Definition at line 27 of file infsupp.h. 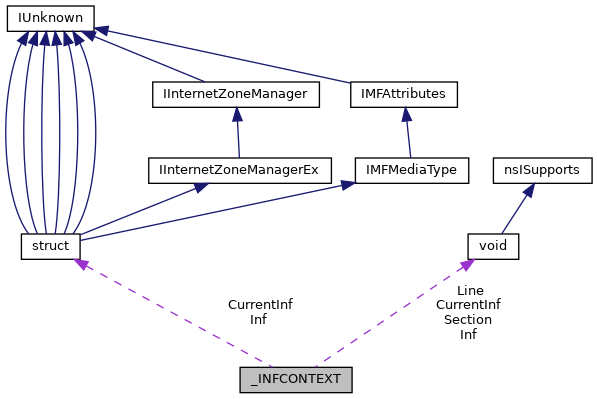 Referenced by InfFindFirstMatchLine(), InfFindNextLine(), InfFindNextMatchLine(), InfpFindFirstMatchLine(), InfpFindNextLine(), InfpFindNextMatchLine(), SetupFindFirstLineW(), SetupFindNextLine(), SetupFindNextMatchLineW(), SetupGetLineTextA(), SetupGetLineTextW(), and test_SetupGetTargetPath(). Definition at line 44 of file inffile.h. Definition at line 70 of file infpriv.h. Definition at line 26 of file infsupp.h. Definition at line 43 of file inffile.h. Definition at line 69 of file infpriv.h.